Growth, as measured through gross domestic product gains, has never exceeded 3 percent for any 12-month period in Chairman Ben Bernanke's nearly 8-year tenure. The central bank's two key measures that it uses to gauge the success of its dual mandate leave something to be desired as well. Inflation, meanwhile, is barely 2 percent -- below the Fed's 2.5 percent target and indicative of an economy that isn't clear of a deflation specter. Those numbers only tell part of the story, though. While the unemployment rate has fallen from 8.1 percent to 7.3 percent over the past year, even those with a job are falling behind. Real average hourly earnings rose just 0.7 percent during that time period and real weekly earnings are up only a tad more, at 1.0 percent. That means even with inflation at relatively tame levels -- at least by government accounting measures -- it still has beaten the growth in pay. And speaking of inflation: The 71 food items tracked by the Bureau of Labor Statistics saw prices rise an average of 2.1 percent over the past year -- not bad, but still well above the rate of pay increase. And speaking of food: More Americans continue to utilize the Special Nutrition Assistance Program -- food stamps -- to deal with their grocery bills. The latest figures show food stamp rolls at just under 47.8 million -- 15 percent of the total population -- and 23,116,928 households, which is a record high. Indeed, the latest Census figures released this week show the number of Americans living in poverty remains at 15 percent -- representing 46.5 million people -- the second straight year the number hasn't moved. Wealth disparity has reached its widest chasm since 1928, the year before the stock market crashed and the Great Depression began. The bright side, of course, is that the market has been having a magnificent year in 2013 and shows little signs of slowing down, shaking off a bevy of macroeconomic and geopolitical scares to a succession of new highs. The housing market also has staked a recovery that nevertheless has slowed in recent months as interest rates have moved higher. That's why the central bank's Open Market Committee is expected Wednesday to begin paring back -- tapering, as stated in the minutes of a recent meeting -- its $85 billion a month in bond purchases. 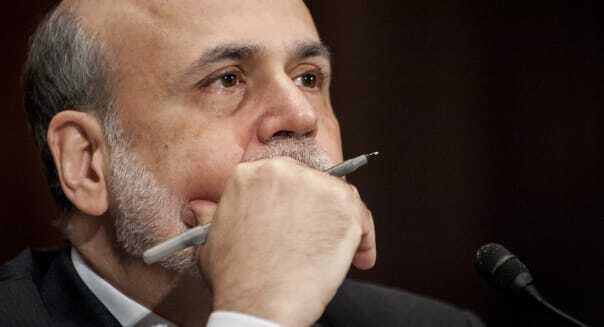 The tapering is expected to be in the $10 billion to $15 billion a month range. The initial tapering talk triggered a sharp stock market sell-off amid fears that a rate increase wouldn't be far behind, and multiple Fed officials have gone public to insist that isn't the case.